Cape Royal is the southernmost viewpoint on the North Rim, and it has the widest panorama of any Grand Canyon overlook - the great gorge occupies about 270° of the horizon, from Marble Canyon in the north, south over Palisades of the Desert, and westwards for many miles towards the main South Rim visitor area around Garden Creek. Quite a long drive is needed to get there, as the point lies 53 miles south of Jacob Lake and the US 89 junction, and 15 miles from the north rim visitor center at Bright Angel Point; this latter section is along a road that is quite narrow and winding in places as it climbs a wooded valley and passes over undulating land linking the Kaibab Plateau with the Walhalla Plateau. 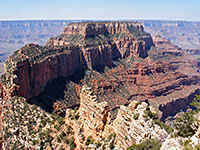 After a pleasant last few miles through the thick pine woodland, the road ends in a loop around a large gravel parking area without any visitor facilities, just a paved, mostly flat trail that leads south towards the viewpoint, at the furthest edge of the north rim landmass. Interpretive signs along the 0.3 mile trail identify some of the common plants of this location, and there are plenty of viewpoints of the canyon to the east. Most memorable is of Angels Window, a natural arch in the Kaibab limestone which frames a little section of the Colorado River, 5,000 feet below and 6 miles distant. A short, railing protected side path leads across the narrow neck of land on top of the window, stopping at a fine viewpoint right at the edge of the cliffs. The main path becomes unpaved and continues a few hundred feet to the final overlook, which is slightly blocked by trees in some directions; the best views westwards are obtained by climbing over the railings and walking a few steps downhill. 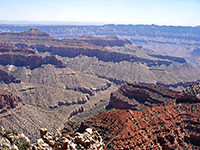 From Cape Royal, the Colorado River is just visible in the east, at the lower end of Unkar Creek, while the main feature due south is Wotans Throne, an isolated, wooded mesa at the same height as Cape Royal but surrounded by vertical cliffs and so completely inaccessible. Freya Castle is a similar, smaller butte a little way east. 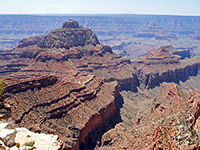 Features directly opposite on the south rim include Sinking Ship, Horseshoe Mesa and Grandview Point, though many miles of the rim are visible, from Palisades of the Desert across to Mather Point.